The last blog presented “Bright Lights and Hot Messes” as we delved into building Strong Women for your stories . . . and in your life. We presented the primary forms of the female lead protagonist in her positive and negative forms. Both hero and heroine seek to balance the dual sides of their nature. In balance, they have achieved maturity and harmony with the world and social constructs. In a dual story arc, Hansel rescues Gretel from the forest’s dangers, but it is Gretel who outwits the evil witch & rescues her brother. I would be remiss were I not to acknowledge that the heroine has her own struggle as powerfully and viscerally transforming as the male’s arc, fully expressed as Joseph Campbell’s monomyth. However, a woman’s conflict often is a metaphorical competitive hero-against-monster. Her monster might be domestic abuse or the repression of a totalitarian patriarchal society. The heroine’s conflict—as with any hero’s—remains one of the individual against community or society. Or the conflict may be the self against the group. Or even individual identity against the collective thought. Her weaknesses are similar, just cast in different concepts. An ancient hero like Theseus might struggle against a minotaur. 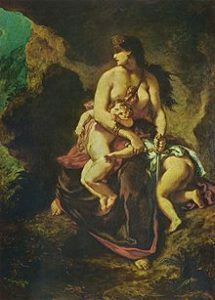 An ancient heroine like Medea might struggle against a foreign culture (embodied in her husband Jason) that views her as less and wishes to cast her aside. A modern hero might struggle against a corporation that stole his invention, as in Flash of Genius, the 2008 film directed by Marc Abraham. for a Trailer of the film, click here. A modern heroine will struggle against a corporation destroying a community’s environment while also challenging mores of a woman’s image in society. This is Erin Brockovich, the 2000 film directed by Steven Soderbergh. for a Trailer of the film that reminds you of the heroine’s challenges, click here. The patterns remain the same. The archetypal journey propels the hero and the heroine to godlike status. (Apotheosis is the big word.) That transformation might also be coercion, as sometimes the protagonist is pulled and pushed into the journey. In broad strokes, the transforming journey of the hero and the heroine are the same pattern. Strong Women, however . . .
Valerie Frankel writes examinations of pop culture’s media, Game of Thrones and Sherlock and Mortal Instruments. She presents the heroine’s journey as its own structure in her From Girl to Goddess: the Heroine’s Journey through Myth and Legend. Click here for a link to the book. One problematic idea within the Heroine’s Journey is her need to reject the feminine, assume the masculine, before returning to and becoming accepting of her feminine self. While all humans are wired for curiosity and amiability (my 31 December 2016 blog “New Advent :: One Resolution :: Be a Writer”), women have additional wires, two of which are paired yet vastly different. Men are competitive, with each other, with “the other”, with the world. Just look at any little boy on a hiking adventure. The competitive instinct drives out of him. The others in the group, the rocks, the stream, the mountain climb, the boulder scramble: he is overjoyed to have something to pit himself against. Women are cooperative. We focus first on unifying our community. We nest with ourselves, our families, our friends. Little girls become must upset at arguments in the family and between friends. Their nest is threatened. They lean naturally into carrying their baby dolls in their backpacks on that hike. Women want to enrich the local sphere. We feel called upon to reach out and bring others into our embrace. Frankel agrees: “The true goal of the heroine is to become this Archetypal All-Powerful Mother. The horrific Medea—who eventually murders her ex-husband Jason’s new bride, the bride’s dad, and then her own children—begins by wanting to restore the destroyed family unit. Jason’s humiliating and total rejection of Medea drives her to wipe out any connection to him. The children via their shared DNA is her greatest connection to him. Those little children never had a chance once she looked at them as mere connective tissue to a man she decided to destroy completely. Stories of young women on quests to restore their nest abound in myths and fairy tales. The heroine of the Seven Swans who uses nettles to weave cloth to save her accursed brothers. Simple Psyche who ventures even into Hades to win back her love Eros. Aataentsic jumps after the Sky Tree and its healing fruit to save her sick husband . . . which leads to the creation of a new sphere for humans. Beauty agrees to enter the Beast’s castle to save her father’s life. And strong women also kill. Sygny’s revenge on the destroyer of her destroyed family requires her to wipe out the family he forced upon her, a lesson to all such men who think women are weak creatures. Jael recognizes the enemy who is attempting to destroy her people. She offers him her tent. When he enters and falls asleep because he believes he is safe, she drives a tent peg into his temple. “This goal (of protecting the nest) does not indicate by any means that the girls are trying to ‘stay at home’ or ‘play house’. Although they redeem beloved family members or potential husbands, these heroines’ work as hard as any fairy tale hero. And they do it WITHOUT SWORDS.” (Frankel) (my emphasis). Frankel’s last comment “without swords” is important. Strong Women . . .
enlist the aid of strangers (the other). up-end the situation to look at it with a different perspective, all to achieve their goal. Yes, some become KickAss protagonists. On that journey, as scary as any fully-armored hero, they become as terrifying as the ancient Medea. They are motivated by familial love or revenge based on familial destruction. An even more fun film with a dual story arc of protagonists is the 2013 Hansel and Gretel: Witchhunters. Join us on the 20th for the last segment of Building Characters. The last 4 Jungian character archetypes are discussed in “Last but Not Least.” After that, we launch into story development.